On Sunday, August 14, I had the pleasure of attending a concert presented by Music in the American Wild at the Sunrise Visitor Center in Mount Rainier National Park. Here at Second Inversion, we have been following this project closely, especially since the group arrived in Washington for the western leg of their tour. After learning about this group and their project months ago, I finally had the chance to attend one of their concerts in its “natural habitat.” This occasion was made even more special by the fact that I had attended their concert in Seattle at the Good Shepherd Center on August 6; the opportunity to compare the group’s performances in these two disparate settings was a rare treat. The concert at Sunrise on Mt. Rainier was the group’s third in that park; they played concerts at Ohanapecosh Campground and Paradise Visitor Center on Friday the 12th and Saturday the 13th, respectively. The rangers had the ensemble set up in the picnic area just north of the Sunrise Visitor Center. The concert began at 2pm, in perfect weather. The concert began with an introduction by Mt. Rainier National Park’s Education Director, Fawn Bauer. Bauer assisted the group as they arranged their visit to the park, helping them organize everything from where to stay to where and when to set up for their concerts. As she began the introduction, it was clear that Fawn was a natural; she put the crowd at ease and warmed them up for the music to come. One interesting fact came to light during Fawns introduction: Over half of the 50-60 people attending this performance had come to the site specifically for this event; the rest had drifted in by chance. The proportion of people that had come specifically for the concert seemed high to me, but it was an inspiring statistic; people will, in fact, visit unusual venues for new music! That said, given how many people were at Sunrise that day, I thought the crowd should have been larger. Note the crowded parking lot. Just like their concert at the Good Shepherd Center, Music in the American Wild’s director and flutist Emlyn Johnson began the performance by welcoming the audience and explaining the genesis of the project. For more on that, see our earlier post. This bit of discussion was the first of many; Emlyn and the other musicians took questions from the audience between each of the pieces. Music in the American Wild’s Emlyn Johnson speaks with the audience at Sunrise. Over the course of the 75-minute concert, some audience members drifted away, but they were largely replaced by new listeners that drifted in and out of the grove of trees in which the concert was set. The audience remained engaged throughout the show, asking many thoughtful questions. The concerts that I attended included five (at Mt. Rainier) six (in Seattle) pieces (of the 11 they commissioned), four of which were the performed on both programs. This overlap presented a special opportunity to compare these nature-inspired works in different settings. The sharp contrasts created by the disparate settings of the two concerts highlight interesting aspects of how location and setting interact with music. One of the pieces that was shared between the two programs was Tonio Ko’s Covers and Uncovers. This piece begins and ends with very soft percussion parts played by all members of the ensemble on desk (or “concierge”) bells. These difference in how this element sounded in the two settings was striking. At the indoor concert at the chapel, the desk bells had the flavor of a “challenging” sound: the kind of sound that might make traditional concertgoers squirm a bit as they get used to the novelty. However, in the outdoor setting at Mt. Rainier, the bells had the opposite effect! Because these sounds exist on the fringes of traditional classical music, they served to blend the opening and closing of Ko’s piece into the natural ambience of the mountainside venue, gently introducing the more traditional sounds to come. The end result was that Covers and Uncovers was one of the more effective pieces on the program at Sunrise. The other remarkable contrast between the two versions of a particular piece that the ensemble performed in both locations was Chris Chandler‘s the view from here. This piece is a musical triptych depicting Shenandoah National Park. The first movement, “drones and swells of the not-far road” was notably different in tone at the two concerts that I attended. 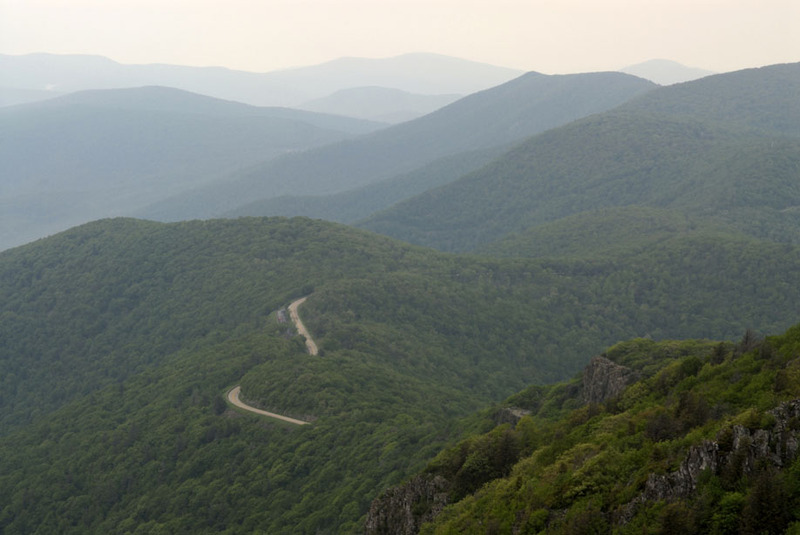 This movement features a musical re-creation of the sounds that visitors to Shenandoah National park hear coming from Skyline Drive, which winds through the entire length of the park. At the Good Shepherd concert, in the middle of the city, the imitation road noise blended pleasantly with the city sounds drifting through the open windows of the Chapel Performance Space; it was easy to accept the sounds of a busy roadway integrated into a natural setting while listening at the Good Shepherd Center. The effect at the Mt. Rainier performance was entirely different. Unlike at the Good Shepherd Center, where the hum of the city is ubiquitous, Mt. Rainier has almost no urban sounds. In this peaceful setting, the simulated road noise of Skyline Drive took on an intrusive and obscene cast. The somewhat dissonant and harmonically unsettled moments in this section of music that sounded perfectly natural in the city sounded grotesque and inappropriate in the near-pristine acoustic of Mt. Rainier. Despite my negative reaction to this element of the piece at the Mt. Rainier concert, the overall effect was positive; the different reactions I had to the piece were a beautiful consequence of experiencing it in two dramatically different locales. These contrasts that arose solely from the different venues of the two concerts can teach us about the musical value of setting. Sure, one would expect some dramatic differences when these concerts are compared; the familiar sound of a rich, warm, wood-heavy concert hall near sea level and the dry acoustic encountered outdoors on the side of a volcano at 6400 feet could not be much more different! Still, the specific ways in which the music seemed to change are worth exploring, especially given that this music was written with wild outdoor spaces in mind. You can catch the final concerts by Music in the American Wild this week in Olympic National Park. Stay tuned to the Second Inversion blog for the final installment of our series on Music in the American Wild, coming next week! You may be aware that this year is the centennial anniversary of “America’s best idea,” the national park system. Created in 1916, the National Park Service (NPS) currently manages 411 sites in the United States and its territories. The national parks themselves, however, predate the NPS, with Yellowstone (the world’s first national park) being founded in 1872, and the land that would become Yosemite National Park being set aside for protection even earlier, in 1864. But, this August, we celebrate the 100th anniversary of the National Park Service itself, which not only protects and manages the parks, monuments, shorelines, historical areas, and myriad other sites in its care, but also serves to makes these sites accessible to the public. If you are in need to a way to celebrate, check out the NPS’s centennial page. Or better yet, attend one of the upcoming concerts in Washington state by Music in the American Wild! And yes, it is exactly what it sounds like. Music in the American Wild is the brainchild of Emlyn Johnson and 17 of her colleagues, all of whom have a connection to the Eastman School of Music in Rochester, NY. This project started with a group of musicians hiking. While hiking at Letchworth State Park in upstate New York (which is awesome, BTW), this group of musicians found themselves with a desire to play music, but they were tragically devoid of instruments. Regretting the oversight, the group began thinking of a way to connect their passion for the outdoors with their love for (and vocation of) classical music. The end result of that thought process is Music in the American Wild. This year, Music in the American Wild has been touring the country, playing fresh new music in national parks. The music they are performing is all new, and has been written specifically for this celebratory tour. Some of the pieces, in fact, have been performed in the very locations that inspired them, such as Chris Chandler’s The View From Here. This piece was inspired by the Big Meadows location inside Shenandoah National Park, and was recorded there in June of this year. Click here to learn more about the composers featured on the tour. So far, Music in the American Wild has performed on tour in several of the high-profile national parks in the Eastern U.S., including Great Smoky Mountains, Mammoth Cave, and Shenandoah, with additional performances at the Smithsonian, The Theatre in Washington, Virginia, and at the Locust Grove Historical Landmark in Louisville, Kentucky. 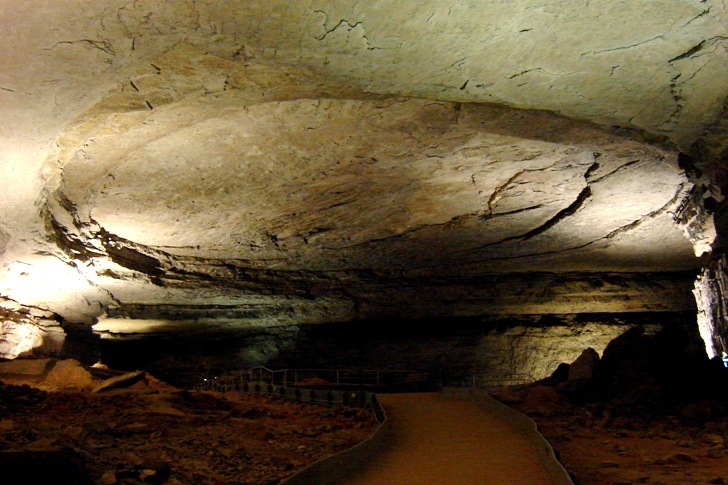 Some of these concerts have occurred in unique venues, including underground in “The Rotunda” at Mammoth cave National Park! Now that their eastern tour is complete, Music in the American Wild is coming to the Northwest! This month, the ensemble will perform at North Cascades National Park, Olympic National Park, Mt. Rainier, National Park, and San Juan Island Historical Park. If you’re in the Northwest, attending one of these concerts in the national park setting for which it was intended is highly recommended. Check out their tour dates for dates and details. However, if you cannot make it out of town, the ensemble will be playing a preview concert at the Chapel Performance Space at the Good Shepherd Center in Wallingford, Seattle on Saturday, August 6 at 8pm (tickets $5-$15). Stay tuned for two more blog installments by Seth Tompkins related to Music in the American Wild, including a review of their performances in Mt. Rainier National Park and an overall reflection on the omnipresent relationship between music and nature.